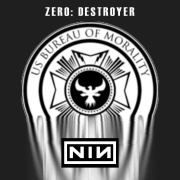 The "Zero: Destroyer" bootleg contains a live DJ set of strangely remixed NIN songs, most prominently from [[Year Zero]] and [[The Slip]]. The songs are sampled in a way to create a story, very similar to plot of [[Year Zero Research]]. 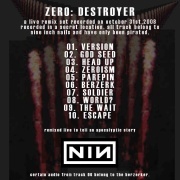 The "Zero: Destroyer" bootleg contains a live DJ set of strangely remixed NIN songs, most prominently from Year Zero and The Slip. The songs are sampled in a way to create a story, very similar to plot of Year Zero Research, although about one obscure character in particular. This characters name is "Chaz Greber" and is found in a report on The Price of Treason.